Injuries, such as Wes Welker’s, have a way of making fans appreciate the precariousness of the minuscule margin between victory and defeat. They realize how fleeting success is, and how cherished the moments of triumph should be. Way back in Week 16 things were looking promising, now it seems like the organization has to pick up the pieces of its shattered dreams and lumber them up to the starting line. Will the Brady and Belichick-led team have it in them to finally put everything together and pull through against all odds? The 5’8” bowling ball of a man has been on a tear this season and will surely try to shred up the Patriots defense in his first playoff game as a bona fide starter. 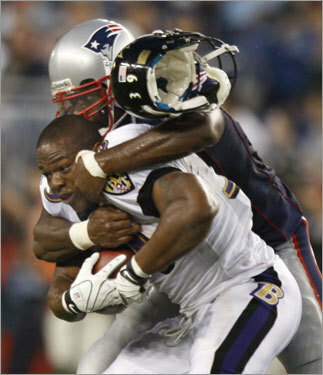 He is elusive, hard to tackle, and clearly the most explosive aspect of the traditionally lackadaisical Ravens offense. Standing in his way is Bill Belichick who has a habit of neutralizing an opponent’s most potent weapon and forcing them to beat the Patriots with its lesser tools. If the Patriots are to have success in this matchup, a rested Vince Wilfork and Ty Warren will have to step it up. Wes Welker’s devastating injury has a ripple effect on the rest of the offense. Opposing defenses no longer have to double-team two receivers, which frees up a potential blitzer. This cranks up the pressure on the Patriots offensive line. Luckily Matt Light and Sebastian Vollmer seem to be up for the task. If Tom Brady has the time he needs to find the open man ala 2001, it will spell trouble for the stout Baltimore defense. Finally, Laurence Maroney, Fred Taylor, Kevin Faulk, and Sammy Morris are all healthy and playing well. With Welker going down, the screen passes and running game need to pick up some of the slack. This will not be an easy task as the Ravens rush defense have given up less then 100 yards per game this season. Mini-Wes has some mighty big shoes to fill. Despite playing well against the Texans, it’s hard to imagine that he will be able match Wes’s league leading performance. However large Edelman’s task may seem, it’s easier then Tom Brady’s daunting mission when he replaced Drew Bledsoe. So fans can still hold out hope for lightning to strike twice at Foxboro. I haven’t see a lot of the Ravens this year, but the past few weeks I’ve caught glimpses of them – it seems to me that Flacco is not playing well, and to be fair, his O-Line doesn’t seem to be protecting very well. Early on, against the Raiders he just didn’t look comfortable, at all. Of course, it would be nice to have a pass rush to take advantage of that…. Thanks for the comment. I agree with you that at time Flacco has not looked consistent and as a result the Ravens record is mediocre. I would lay some of the blame on his weak wideouts; while I love Kelly Washington, he shouldn’t be starting for a playoff team.